Dr. Santosh Khurma specializes in internal medicine with an emphasis on geriatric medicine. She is Board Certified in Internal Medicine since 1987 and Geriatric Medicine since 1990. Dr. Khurma sees patients over 18 years of age. Dr. Santosh Khurma specializes in Internal Medicine for patients in Xenia, Ohio, and surrounding communities. She received her medical degree from Banaras Hindu University, Institute of Medical Science in India . She completed her residency at Wright State University and Good Samaritan Hospital.Dr. Khurma provides preventive care and injury care for patients of all ages and medicine refills. She also provides care for health issues associated with aging. 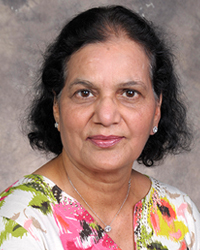 She is Board Certified in Internal Medicine since 1987 and Geriatric Medicine since 1990. She makes patients her first priority, taking an active role in their health care so that you feel the care you receive is centered around you.